Sue returned to Praxis in May of 2015 as the Office and HR Manager in the St. Paul office. She worked for us previously from 2002-2007 supporting our Praxis Safety & Accountability Audit project. For the last seven years Sue has been farming in Vermont, most recently as the owner of Two Dog Farm, producing organic vegetables and blueberries, grass-fed beef, and maple syrup near a little town called Danby. 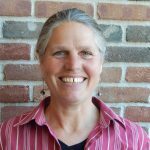 Sue has always had a passion for social justice and environmental issues, and has always held the mission of Praxis near and dear to her heart. Sue also co-facilitated men’s education classes for the Domestic Abuse Intervention Project in Duluth for several years, and was Executive Director of the Duluth Community Garden Program for 10 years. This project leased out garden plots and provided education on organic gardening and food preservation, with a focus on healthy food access for people with limited incomes. She also spent several years as a farm manager at Smokey House Center, a non-profit agency working with teenagers at risk of dropping out of school. In her free time Sue enjoys spending time outdoors, especially hiking, backpacking and skiing.